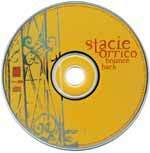 To satisfy listeners after ForeFront Records pushed off Stacie Orrico's sophomore album to a later date, they released the Bounce Back Enhanced CD Single. With a brand new song, a remix of an old favorite, small snippets from the upcoming album, and plenty of bonus material to keep you busy, the Bounce Back Enhanced CD Single is sure to be enough to tide listeners over for a while. Beginning with the fun, upbeat "Bounce Back", the single is off to a tremendous start. A little funky, the song talks about dealing with sin, and bouncing back to where we should be: walking in the Spirit. I have complaints about the "Genuine: Very Real Remix". Besides a few new drum loops and being shorter than' the original by thirty seconds, the song has barely changed. Personally, I wish they would have remixed a different song from the Genuine album, one with a bit more fanfare, such as "Don't Look At Me". The sixty seconds of "Medley: Hesitation/Strong Enough/I Could Be The One" does its job in giving us just enough to want more. The enhanced material on the disc is great. A music video for "Everything" and a behind the scenes for the video are included, as well as commentary on "Bounce Back", "Without Love", "With A Little Faith", "So Pray", and on the Genuine album. The "exclusive" photo gallery contains four pictures from cover art for Genuine. Two screen savers, two wallpapers, and three buddy icons complete the bonus material. Overall, it's enough keep the listeners satisfied until there's more from Orrico. From the sounds of it, Stacie Orrico's sophomore album looks to be a winner.